Here we are with the last Monday Funday of February...how time flies. This week's challenge is Anything Goes so pull out whatever TGF stamps you have an go to town! 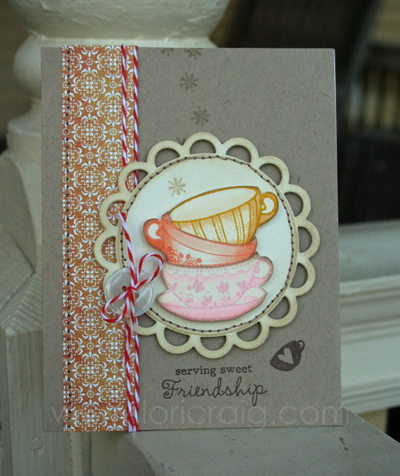 My card base is cocoa with layers of kraft and Bo Bunny Mammarazzi. I used a zig zag stitch on the layered piece and a small straight stitch around the base. The border punch is Martha Stewart and I added silver brads at each point. The ribbon is SU's Night of Navy and Early Espresso grosgrain. The sentiment is from the Bo Bunny Mammarazzi line and has a added SU star brad. The image is TGF's Wild Sprout Jeremy, colored in copic markers and mounted with dimensionals. It's my turn to host this week's Monday Funday at TGF's Farm Fresh Challenge blog and I chose "Show your primary colors". My card base is SU's Whisper White cardstock with layers of Only Orange and Brilliant Blue (retired *sigh*). The gingham is open stock paper from Michael's. I used the EK Success ABC border and stitched around the blue layer. Next, I wrapped the orange layer with Early Espresso baker's twine and mounted the sentiment from Off the Chart (retired) with dimensionals. The image is Ian from TGF's Special Autumn, colored in copic and mounted with dimensionals. I made my card using the same design and stamp from TGF's Tea-rrific set. The base is kraft with paper from SEI and SU's Real Red. I used the heart postage stamp with Versamark on the kraft. The border is SU/EK Success pinking hearts punch. The tea cups are stamped in Blazing Red, Dove Gray, and Timber Brown Staz-On then cut with the lacy circles nestabilities, then mounted with dimensionals. I stamped the sentiment in Timber on the kraft base. I wrapped the cherry cobbler baker's twine and tied it off with a pink button. I spritzed it with Mixed Berries and Cherry Ice Smooch, but you can see the nozzle went a little nuts, so it went way overboard. Ooops. These are the treats I made for my preschooler's teachers. They are 3x3 post-it note holders. The paper is Calypso Coral that is run through the Swiss Dots embossing folder. Dimensions are 3 1/4 x 6 3/4 inches. The scallop circle is Whisper White and stamped with Jet Black Staz-On using the CTMH Little Treasures set. I used Calypso Coral, Pool Party, Lucky Limeade, Purely Pomegrante, and Wisteria Wonder inks and a blender pen to color the conversation hearts. I punched a hole on each side of the jar, using an embroidery needle to thread the Cherry Cobbler baker's twine through. I stamped each post-it with the conversation hearts, then used double stick tape to mount the notes in the wrap. I folded the wraps so they would have an easel to display the image. So I was picking through some colored images I had and was inspired to join Pixie Dust Studio for this week's "Double the Fun" challenge. Instead of a card, I decided to do a spread in my SMASH album. I have posted a Twilight page and decided Harry needed one of his own as one of my favorite series. February Retro-Fresh Challenge: Getting dimensional! This month's retro-fresh challenge at TGF's Farm Fresh Challenge blog is to get dimensional! Remember that this challenge is where you have to use a TGF stamp that is at least six months or older. I have these great Art Blanche pre-cut containers that I found on clearance. This one is a cute little purse box with cut out windows. I stamped it with crowns and sentiment (studio g) in Blazing Red and Jet Black Staz-On. After that, I spritzed the box with Silver Foil and Gold Glow smooch spritz. I put a clear window sheet behind the bubbles. The image is TGF's Dressy Joyce digi colored with copic markers and mounted with dimensionals. The crown is from the dollar bin at Michael's and is embossed with gold metallic embossing powder. I added pearls to the crown to add some extra dimension. The final touch is to the checked ribbon. This week is one of my favorite challenges because the possibilities are endless...stitching. So, I pulled out my trusty sewing maching because I love the look of machine stitches. I used a straight stitch around the edge of the card and zig zag stitches along the scallop border. The base is vanilla with layers of kraft. The patterned music paper I found on another blog. She used a photo of the vintage sheet music to create drawer liner for a desk. Isn't it fab?!? The sentiment sheet is from K&Co Smash Entertainment themed pad. They are so quirky and add a quick embellishment to your project. I used SU's lacy scallop punch to add a border and added little pears between the scallops. The image is from the new Miss Anya Garland and is colored in copic markers, then mounted on dimensionals.